Registration for the 2009 Bacon Run opens June 1st. All proceeds go to the Shriners Hospitals for Children. Science is awesome. Why, you ask? 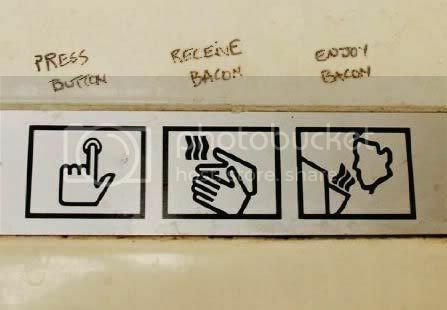 Well thanks to science, you can now dry your hands with Bacon! And it's FREE!! Some crafty Baconpeneur has discovered a way to shoot waves of Bacon at your hands with such force it scares the wetness away. Bill Gates, look out! This guy will be nipping at your heels in no time. p.s. When Chuck Norris was denied a Bacon McMuffin at McDonalds because it was 10:35, he roundhouse kicked the store so hard it became a KFC. Looking for the right treat to get your kids headed down the Bacon highway (as if Bacon itself wasn't enough)? How about breakfast in a lollipop?! Maple-Bacon flavored lollipops will fit the ticket or my name isn't Conab Nacob. Pop one of these little suckers in junior's mouth and before you know it he'll be sitting at the breakfast table with the big boys. Thank you, Lollyphile, for making the world a tastier place. When I first read Indy in the Kitchen's recent submission for the Kettle Brand Create-a-Chip Challenge I thought it was genius. Then I started looking around and realized, Bacon Potato Chips aren't anything new. Stupid me, I'm fairly certain I've had some. Either way Kudos to the Bacon Potato Chip Engineers out there for making an already tasty treat even saltier and delicious. I think my favorite has to go to Mike-Sells Mesquite Smoked Bacon Flavor for serving them up with a beer! Worried about getting Bacon stuck in your teeth? Well Bacon to the rescue!! Bacon Floss, to be more specific. Those crazy folks over at Geekologie found this one, and I've gotta say, it sure beats the heck out of plain old cinnamon! Who says you can't have your Bacon and eat it too. There's nothing old school about shredding it up on a Bacon Skateboard. This ain't yo momma's board and you won't catch Steve Caballero on one either. That's only because he hasn't heard of it yet! Be the first in your neighborhood to be rocking the sizzlin crispy style of a Bacon Skateboard today! Thanks to the folks at Holy Taco for sharing this Man Meal. I think it speaks for itself. Some folks were unfortunate enough to grow up without a hot meal for breakfast. They've recently discovered Bacon, but are still accustomed to eating out of a bowl. Well if you're one of these people with a phobia for eating breakfast off a plate, let us introduce Bacon Cereal. It looks horribly delicious, and each bowl is guaranteed to take at least a week off your life! Follow this link for more images and details. A Grand Rapids resident told police last week that someone had entered his home during the night and taken five pounds of bacon from the refrigerator. Upon further investigation, police discovered his wife had gotten up for a late night snack, but was afraid to admit it. DISCLAIMER: We tried to verify this story, but were unable to find anything other than copies of the same image. Snopes doesn't have anything either. Either way, it's hilarious. This one's an oldie, but a goodie. The Bacon Explosion is a culinary marvel. In short, it's seasoned Bacon, filled with Sausage, filled with more Bacon, and smothered in delicious BBQ sauce. Those folks over at BBQ Addicts sure do get the blood flowing... right before your heart stops! I think this is one of those things you should probably eat once and only once in your life. Possibly the best 5 1/2 minutes all about Bacon you'll ever see. If you're a businessman (or businesswoman) who really likes your meat, and you want this reflected to everyone you meet (pun intended), might I suggest meatcards. They're business cards made out of beef jerky (Bacon's first cousin). And while you're at it you can store your meatcards in your Bacon Wallet! It's a meat-on-meat extravaganza!! It will make all your financial transactions delicious. Now everyone will see your awesome power and mastery over all that is meat. Thanks to @dougbellenger (PhindMe) re-tweeting @r38y re-tweeting @meatcards. The salty aroma of the Kawaii Bacon Air Freshener is a welcome scent for any car. I would enjoy the meat candy smell during my morning commute, and be thrilled with the reminder in the afternoon commute home. DISCLAIMER: while driving it is important to savor the bacon flavor with your eyes open and on the road! ... [W]hile the taste of bacon emerged as a subtle undercurrent, the richness of the mixture was downright devilry. Sensations of maple, meat, and brown sugar streamed from the spoon in deceptively smooth ribbons of flavor, each more consummate than the last. The fresh bacon bits completed the picture perfectly, providing a savory punch and a scatter shot of focus for the bacon fat in the ice cream. Just when you thought the most delicious food item in the world couldn't get any more wonderful, someone goes and deep fries it. That's right, Sodolak’s Country Inn's Chicken Fried Bacon. It's delicious and you deserve every grease topped calorie. Is it candy? Is it Bacon? It's both! It's Bacon Candy! The folks over at Hey That Tastes Good have provided DIY instructions on how to make your own Bacon Candy. Now you can clog your arteries and rot your teeth all at the same time! We all know Homo Sapiens love Bacon, but animals do too! That's why we're presenting the Bacon Birthday Cupcake for Doggies. Because there's nothing better than enjoying your favorite food with your favorite friend. p.s. Nothing says you can't eat them too! Wow, these look like the most delicious cupcakes I've ever seen. Next time I'm in Boulder Colorado I'll have to swing by Tee & Cakes to try some. Do you ever find yourself lip-locked with your significant other, only to find yourself craving the sweet sweet flavor of Bacon? Well thanks to the folks over at J&D, you can now satisfy both carnal cravings at once. Introducing Bacon Lip Balm. For the times when kisses alone just aren't quite enough. Welp, it's official. Bacon is the best meat out there (which also makes it undoubtedly the best food out there). In a nail-biter, Bacon edged out Steak in a 57%-43% victory, claiming the title of Meat Maddness: Favorite Meat in the World!!! Not that I ever had any question, but it's nice to see this put on the record. Gooo Bacon! Combining the two was only a matter of time, and I'm sure this isn't the first incarnation, and it definitely won't be the last. Either way, we are now graced with the presence of Mo's Bacon Bars. Mmmm salty sugary goodness. Do you ever have that feeling like your salt tastes a little bland? That it's missing that special something? J&D's has the solution to your problem. Bacon Salt. It's Fat Free, Calorie Free, Vegetarian (a term I didn't think I'd ever be using in this blog), Kosher, and alllll Natural. So what are you waiting for? There's no reason everything can't taste like Bacon! This is quite possibly the epitome of Bacon usage. The Bacon Lance, capable of cutting through steel. Stock up on Tactical Bacon so when Zombies attack you can still eat GREAT! The new Tactical Bacon from CMMG ® includes 9 ounces of pre-cooked bacon goodness, ready for any apocalyptic scenario with a 10+ year shelf-life. 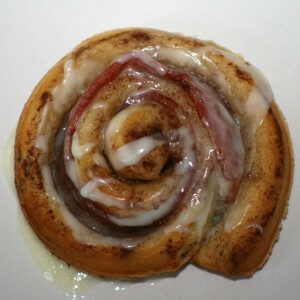 There is something terrifyingly amazing, disgusting yet delicious, about the thought of a Bacon Cinnamon Roll. It's meat and desert all wrapped up into breakfast. I only wonder why I didn't think of it first. Thanks to ThinkGeek and Vilhelm Lillefläsk for bringing us bacon in a bottle, otherwise known as Squeez Bacon®. Bacon at breakfast not enough for you? How about adding a little savory Bacon flavor to your night cocktail? We bring you Bakon Vodka. Bakon Vodka is a superior quality potato vodka with a savory bacon flavor. It’s clean, crisp, and delicious.